Þiðreks saga af Bern ('the saga of Þiðrekr of Bern', also Þiðrekssaga, Þiðriks saga, Niflunga saga or Vilkina saga, with Anglicisations including Thidreksaga) is an Old Norse chivalric saga centering the character it calls Þiðrekr af Bern, who originated as the historical king Theoderic the Great (454–526), but who attracted a great many unhistorical legends in the Middle Ages. The text is either a translation of a lost Low German prose narrative of Theoderic's life, or a compilation by a Norwegian or Icelandic scholar based on German material. It is a pre-eminent source for a wide range of medieval Germanic legends. The name Vilkinasaga was first used in Johan Peringskiöld's Swedish translation of 1715. Peringskiöld named it after Vilkinaland, which the saga says was an old name for Sweden and Götaland. The saga contains many narratives found in other medieval tales about Theoderic, but also supplements them with other narratives and provides many additional details. It is not clear how much of the source material might have been orally transmitted and how much the author may have had access to written poems. The preface of the text itself says that it was written according to "tales of German men" and "old German poetry", possibly transmitted by Hanseatic merchants in Bergen. Contrary to the historical reality of Theoderic's life, most of the action of the saga is set in Northern Germany, situating Attila's capital at Susat (Soest in Westphalia) and the battle situated in the medieval German poem Die Rabenschlacht in Ravenna taking place at the mouth of the Rhine. This is part of a process operative in oral traditions called "localization", connecting events transmitted orally to familiar places, and is one of the reasons that the poems collected by the saga-writer are believed to be Low German in origin. Heroes from the story of Theoderic, after a wall-painting in Floda church in Södermanland. At the centre of Þiðreks saga is a complete life of King Þiðrekr of Bern. It begins by telling of Þiðrekr's grandfather and father, and then tells of Þiðrekr's youth at his father's court, where Hildebrand tutors him and he accomplishes his first heroic deeds. After his father's death, Þiðrekr leads several military campaigns: then he is exiled from his kingdom by his uncle Ermenrik, fleeing to Attila's court. There is an unsuccessful attempt to return to his kingdom, during which Attila's sons and Þiðrekr's brother die. This is followed by Þiðrekr's entanglement in the downfall of the Niflings, after which Þiðrekr successfully returns to Verona and recovers his kingdom. Much later, after the death of both Hildebrand and his wife Herrad, Þiðrekr kills a dragon who had killed King Hernit of Bergara, marrying the widow and becoming king of Bergara. After Attila's death, Þiðrekr becomes king of the Huns as well. The final time he fights an opponent is to avenge the death of Heime (who had become a monk and then sworn loyalty to Þiðrekr once again). After this, he spends all his time hunting. One day, upon seeing a particularly magnificent deer, he jumped out of the bathtub and mounts a gigantic black horse – this is the devil. It rides away with him, and no one knows what happened to him after that, but the Germans believe that he received God and Mary's grace and was saved. In addition to the life of Þiðrekr, various other heroes' lives are recounted as well in various parts of the story, including Attila, Wayland the Smith (in the section called Velents þáttr smiðs), Sigurd, the Nibelungen, and Walter of Aquitaine. The section recounting Þiðrekr's avenging of Hertnit seems to have resulted from a confusion between Þiðrekr and the similarly named Wolfdietrich. The Stockholm manuscript is earliest, dating from the late thirteenth century. 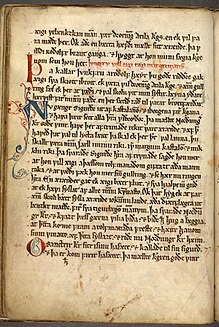 Þiðreks saga was the basis for the Swedish Didrikssagan, a translation from the mid-fifteenth century. The Swedish reworking of the story is rather independent: many repetitions were avoided and the material is structured in a more accessible manner. The Swedish version is believed to have been composed on the orders of king Karl Knutsson, who was interested in literature. Þiðreks saga had considerable influence on Swedish historiography as the saga identified the country of Vilkinaland with Sweden and so its line of kings was added to the Swedish line of kings. In spite of the fact that the early scholar Olaus Petri was critical, these kings were considered to have been historic Swedish kings until fairly recent times. The historicity of the kings of Vilkinaland was further boosted in 1634 when Johannes Bureus discovered the Norwegian parchment that had arrived in Sweden in the 15th century. Richard Wagner used it as a source for his operatic tetralogy Der Ring des Nibelungen. Saga Didriks, Konungs af Bern. Norwegian translation of 1853 by Carl Richard Unger. ^ a b c d e The article Didrikssagan in Nordisk familjebok (1907). ^ Davidson, Andrew R., ‘The Legends of Þiðreks saga af Bern’ (Unpublished Ph.D. Dissertation, University of Cambridge, 1995). ^ a b c d The article Didrik av Bern in Nationalencyklopedin (1990). ^ Henrik Bertelsen, Om Didrik af Berns sagas, oprindelige skikkelse, omarbejdelse og handskrifter (Copenhagen: Rømer, 1902), p. 1.